Many factors behind the acne development on the skin such as bacteria, excessive oil reproduction, dead skin cells, clogged pores, poor diet, stress and sometime hormonal imbalance. They can be treated but some time they are hard to treat and it makes people frustrated. If you not treat acne for long period it will cause dark spots and scars appear on your skin. There are many creams available in the market, sometime they worked good and sometime not worked and waste of the money because some of them are too expensive. 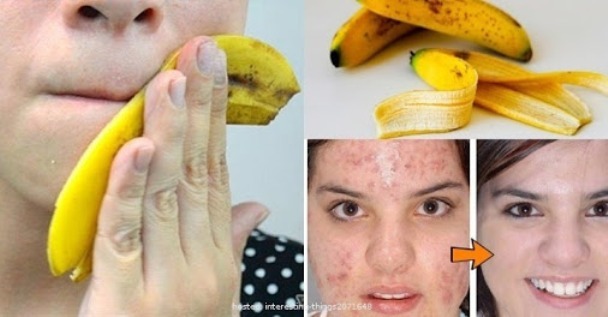 Today I am sharing with you a natural way to treat acne problem using the banana peel. This is very cheap and effective method to reduce your acne. Always you throw the banana peel after eating it, but from now you will not throw the banana peel because it will effective to solve your acne problem, here are the some amazing benefits of banana peel. It helps to reduce pore toxins due to its natural exfoliating properties. It is in high manganese, iron and zinc that help to reduce redness on the skin. Banana peel is fully packed with Vitamins A, B, C and E that contribute to healthy skin. The property of Vitamin E is antiseptic that prevent the bacteria infection to stop the cause of acne and heal acne scars. This peel help to drying out the excess facial oil to reduce clogged pores. Banana peels - First wash your face with cool water and a milk cleanser and pat dry it. Cut the fresh banana peel into small pieces and massage your face with inside part of the peel for 10 minutes. when the peel skin become brown, throw it and take a fresh one again. Wait for 20 minutes before wash your face. Follow the process 2 times daily. Banana peel and baking soda - mesh a banana peel until it becomes paste. Now take a small bowl and add 1 tbsp of this paste and 1/2 tbsp of baking soda and add enough water, mix them all to make a fine paste. Apply this paste on your skin using the cotton ball for 2 or 3 minutes. Then wash your face with lukewarm water and pat dry from soft towel. Apply oil free moisturizer on your face. Follow the process on regular basis. Banana peel and lemon - Lemon has natural acidic and bleaching properties in it which helps to kill bacteria that cause acne and its scars. Make a paste of banana peel and take one tbsp of this paste and mix with one tbsp lemon juice. Apply this paste on your face using the cotton ball and gently massage for few minutes. Leave it for 15 minutes on your skin, and then rinse it off with warm water. Follow the process on regular basis. Banana peel and honey - first mesh a banana peel to make their paste. Now take 1 tbsp of this paste and mix it with 1/2 tbsp of honey. Apply it using a cotton ball in circular motion on the affected area. Leave this paste for 15 minutes, and then wash it with lukewarm water. At last, apply any oil free moisturizer. Follow the process daily. Banana peel with oats - Add one banana peel, 1/2 cup of oatmeal and 3 tbsp of sugar in a blender. Blend all ingredients to make a smooth paste and apply it on your affected skin and massage for few minutes. Leave it for 10 minutes and then wash off with warm water and pat dry. At last, apply any oil free moisturizer. Banana peel and turmeric scrub - turmeric has anti-inflammatory and anti-bacterial properties which help to reduce redness and swelling. Mesh one banana peel to make paste now add same quantity of turmeric powder and add enough quantity of water and mix them well to make a fine paste. Apply this paste on your skin and massage for few minutes in circular motion. Leave it for 15 minutes and then rinse it with lukewarm water. At last, apply any oil free moisturizer on your face. Follow the process daily to get clear skin.